I tweeted today that my favourite food of the holiday season is Clementines. They are the perfect fruit. Easy to peel, bite-size wedges of sweet, juicy goodness that are almost always seedless. Delicious and nutritious indeed. Now I don’t fool around. I buy my Clementines by the crate because I eat a lot of them. I can easily go through a crate a week. By myself. DH doesn’t eat them. Actually, he doesn’t eat any fruit but that’s a discussion for a whole other blog post. DD likes them one day and doesn’t the next. No matter, it means more Clementines for me! When I was growing up, a Clementine was always placed at the toe of each family member’s stocking. Every year we’d work our way through the chocolate and trinkets until that last plunge of the arm into the stocking made contact with this beautiful fruit. My brother, sister and I would forego our collected sweets and eat our Clementines then and there. Yum. I started thinking about other holiday traditions and how special and unique they are family to family. For example, in my family Santa doesn’t wrap stocking stuffers but in DH’s family, Santa does. In both sides of the family stockings are opened first, but I’ve heard others say they open stockings after gifts are opened. Between DH and I, the tradition is that I string the lights on the tree but he strings the lights outside. My holiday baking tradition includes sugar cookies and butter tarts (sans raisins!). I make them every year without fail. My friends and I had a potluck brunch last December with our respective families and we plan to do it again this year. It’s a tradition I hope we continue each year. These rituals centred on family, well…they just make me smile. I’m looking forward to starting new traditions with DH and DD beyond the Clementine-in-the-stocking one. I don’t really know what these rituals will be, but I look forward to the discovery. What family traditions do you incorporate into the holiday season? Love clementines! My DD specifically asks that we don’t forget her clementines in her stocking every year. I love clementines too, but I am never able to get through a crate by myself, try as I might. You’re my new hero! We are still working on establishing traditions, but the request in this home is to wait until after the 21st to decorate. DH’s birthday is December 21st, so it’s a reasonable request and it helps avoid getting Christmassed out. A new tradition this year is building a gingerbread house for two, but none of this wait-forever-to-eat-it nonsense, once it’s complete, we are going to start the nomming. Tamara, I like your style. Of course eat the gingerbread house asap! Just makes sense! That’s a wonderful tradition for the two of you to start. Happy nomming! I can appreciate why your DH wants to hold off on the decorating the house up. We decorate a couple of weeks into December but New Year’s Day – bam! It’s all taken down. Growing up we would first open stockings (unwrapped) and then the gifts. The stocking usually consisted of candies, socks and one year my brother received coal…lol… which he wasn’t too happy about. It was always exciting Christmas morning to open the gifts. One day I hope to carry a special tradition with my family. *pre-Christmas-we always do advent calendars. I’ve since bought a “fill your own” one that I put 2 yummy chocolates in each day for my 2 girls. Christmas Eve-My husband’s Mom is French-Canadian, and he grew up Christmas Eve having Tourtiere. I now make my own version and we have that every year. Usually, after we’ve eaten, we head to the O’Donoghues for their annual Christmas Eve party. I’ve been going since I was a teenager (along with Kerry, Alison, Shannon) though it’s changed through the years with marriages and children and people’s lives changing. Sadly, since we moved, I’ve missed out. Karen hosts it now (instead of her folks). I truly miss it and all of the memories created there. We would get home super late and I’d stay up wrapping presents and placing stuff under the tree. -My kids open one gift Christmas Eve-which they know will be new jammies to wear to bed that night. -We always open stockings first, unwrapped. -This is my Granny’s bday. She passed away when I was a teen and I miss her terribly still. She was a huge part of my life and upbringing. She used to have Turtles chocolates every year on her birthday, so on this day I have a box ready and we all eat a Turtle in a toast to her. Are you sorry you asked? 🙂 Those are some of ours. I think these kinds of traditions are so important and sacred and meaningful. Keep on creating them Mel! I don’t know when we’ll pull our tree out…maybe next weekend! Oh, clementines!! My mom would always bring crates home at this time of year and I remember getting canker sores all on the inside of my mouth from eating so many as a teenager … and even then, I still couldn’t resist them! Now, I don’t dare buy a crate for my house. As for traditions, we do stockings on our bed in the morning with the kids, then my family all comes over and has a casual brunch at our home where we open up all the gifts then. That’s a nice way to share Christmas morning – to open stockings upstairs versus a mad rush downstairs. A sort of easing into the rush that can be Christmas day. Thanks for sharing your traditions! 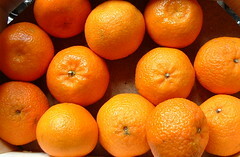 Mmm, clementines smell like Christmas! We have been through crates and crates of them already. My 3 year old loves to peel them himself, he’s so proud of himself.